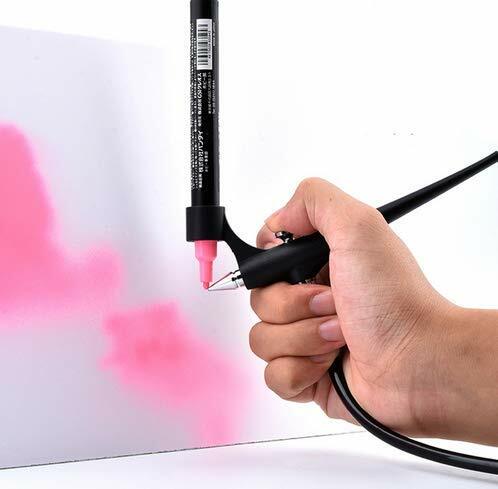 ☸ Marker Airbrush is easy to use without cleaning,just change the marker.It perfectly suitable for children & beginners & model building hobby tinting. ☸ The Airbrush connector is 1/8 mm, which is suitable for most compressor original hose on the market, while other compressor interfaces should be used with air hose adapter. ☸ Create unique cards of Christmas, Birthday, Mother\'s / Father\'s Day for any occasion.Personalise your invitation cards & school books, design outstanding book marks or scrapbooks. ☸ Press the button to get the colour, you can stop spraying any time.It will not stain your clothes, walls, floors and other objects.No mess, no fuss and best of all no fiddly or complicated parts.